Vancouver has, arguably, the best summer weather in Canada - and I say "arguably" since there are periods of time when the city experiences nothing but chilly temperatures and nonstop rain. But today was one of those perfect summer days: sunny, with a nice breeze. So even though the trip to Cattle Cafe involved a 25-minute walk from Richmond Centre, I didn't mind it too much. I was somehow able to time the walk perfectly, and met up with my grandparents in the parking lot adjacent to the plaza just as they pulled into a parking spot. I ordered a Neapolitan Spaghetti and iced milk tea, while they ordered Chinese noodles with different soup bases and Horlicks/hot milk tea. Since I had been dying to try out the restaurant's shaved ice during my last visit (but ultimately ending up not ordering since I was already full), I opted for a mango shaved ice with coconut jelly, grape jelly, and grass jelly for toppings! Though it couldn't possibly compare with the mango shaved ice we tried in Ximending (which used mango-flavoured ice instead of regular ice with mango milk syrup poured on top), it was still an awesome icy treat for a summer day. Later on we went to Parker Place and Yaohan. If you've never seen the Chinese version of pizza, well, here it is. It's basically a flat bun, with sausage, green onions, tomato sauce, and a thin layer of mozzarella cheese thrown on top. You'll sometimes find kernels of canned corn on top as well. I had been in search of some checkerboard cookies, but since the bakery at Parker Place didn't seem to carry them, my grandmother suggested we check out the T&T at Yaohan instead. Turns out they did have them, in addition to having a panda version of the cookie. But at $5.99 a box, I just couldn't justify the price, and left the supermarket to wander upstairs. I found these little chibis to be pretty adorable. To be completely honest, there really isn't much to do at Yaohan. They have a pretty decent food court, and an extremely wide (though not quite budget-friendly) selection of packaged snacks and Asian beauty products at Osaka T&T, but there isn't much else except for some mattress and phone service stores. Before leaving, this amazing Buy 1 Get 1 Free bubble tea deal caught my eye. And so, me being the avid milk tea-lover that I am, I couldn't help but try it out, despite still being exceptionally full from lunch. I ordered one of each type: Milk Tea and Green Tea. I snatched up the green tea; it wasn't overly sweet, and the tea didn't taste too milky either. Though they must have used pretty strong tea to make it, as it was slightly headache-inducing for all of us. Nonetheless, $3.99 + tax is an amazing deal for two bubble teas with tapioca included. We headed back after ordering the teas, but not before I stopped to snap a photo of this. Hmmmm? Can't quite see it? Well, let's zoom in and get a closer look. 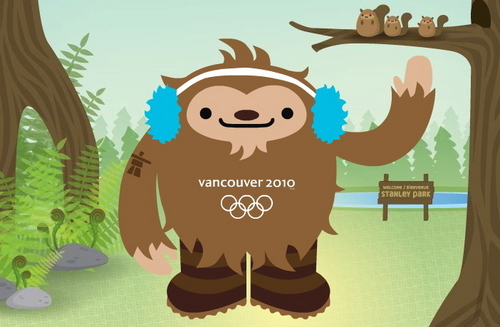 I love(d) all the Vancouver 2010 Olympic mascots, but among all four of them, he's my absolute favourite!